Note: This trailer contains a small amount of bad language. 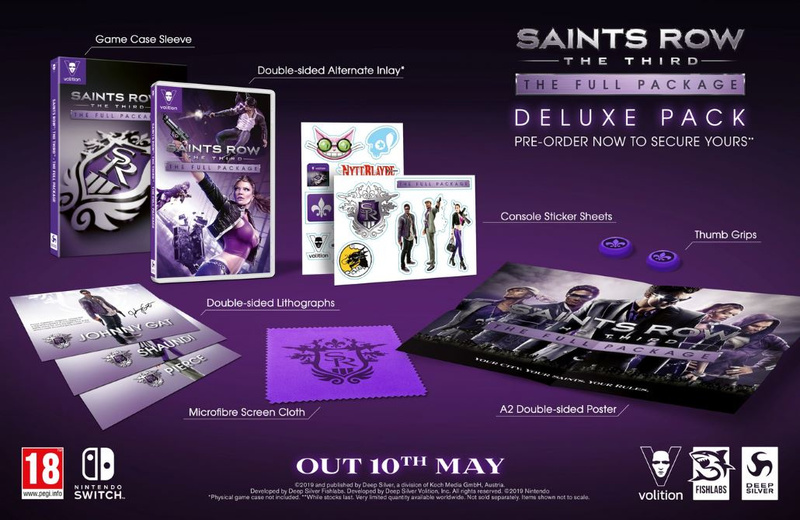 A brand new trailer for the upcoming Saints Row: The Third – The Full Package has just been released, coming alongside the announcement of the game’s Deluxe Pack which is available to pre-order from GAME starting today. · City of Sin – Disrupt and dismantle the Syndicate stranglehold on weapons, cybercrime, and criminal rackets. Discover the secrets of Steelport, where there is action on every street corner, for better or, more likely, worse. · Weapons of Crass Destruction – It’s one thing to defeat your enemies. It’s another to humiliate them. Hover jets, human cannonball cars and melee weapon warfare are all part of the fun. · Joy-Con Crazy Customisation – Create the most outlandish characters ever seen, from washed-up celebrities to maskless ninja pirates. Inside every sinner, there is a Saint. Who will you become? · Portable Over The Top Co-op – Fly solo, or play online with a homie and for the first time – two players can play side to side via online or local multiplayer. Give freefall skydiving a try, landing in your partner’s flaming pickup as you make a desperate run toward a heavily armed Syndicate base. Steelport is always more fun with a friend. * Two DLC packs – the Bloodsucker Pack and the Unlockable Pack, have been omitted for game balance and improvement based on feedback. Are you excited to take Saints Row on the go? Let us know with a comment below, yo.